In fact that lethal phrase had been known for at least a century previously, when it was ascribed to the Spanish princess Marie-Thérèse, bride of Louis XIV, in a slightly different form: if there was no bread, let the people eat the crust (croûte) of the pâté. It was known to Rousseau in 1737. It was credited to one of the royal aunts, Madame Sophie, in 1751, when reacting to the news that her brother the Dauphin Louis Ferdinand had been pestered with cries of 'Bread, bread' on a visit to Paris. The Comtesse de Boigne, who as a child played at the Versailles of Marie Antoinette, attributed the saying to another aunt, Madame Victoire. But the most convincing proof of Marie Antoinette's innocence came from the memoirs of the Comte de Provence, published in 1825. No gallant guardian of his sister-in-law's reputation, he remarked that eating pâté en croûte always reminded him of the saying of his own ancestress, Queen Marie-Thérèse. It was, in short, a royal chestnut. Antonia Fraser, Marie Antoinette: the journey (pbk, 2002), p.160-1. Marie-Antoinette may never have uttered the notorious words, but oh what a delicious marketing concept! 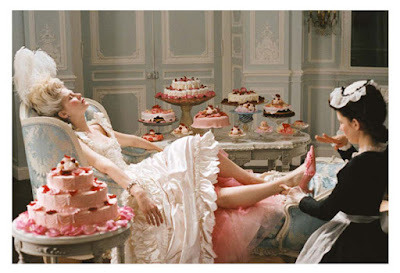 In 2006 Ladurée, the French luxury pâtissier, scored a major coup by negotiated with Sofia Coppola to fill the visually sumptuous set of the film Marie-Antoinette with gloriously presented and suitably decadent gateaux and pastries. Cakes became chic, youthful, bright and faintly irresponsible. Marie-Antoinette, notes one marketing website, is "worth watching for the food styling alone". Quite true - though the costumes are marvellous as well! Of course, it is all marketing hype: Ladurée has no connection whatever with the real Marie-Antoinette. The original Paris pâtisserie and tea shop was founded only in 1862. Today the company is a global concern. According to the latest count, there are 85 outlets in 30 countries (including stands at Orly and Charles-de-Gaulle airports!). 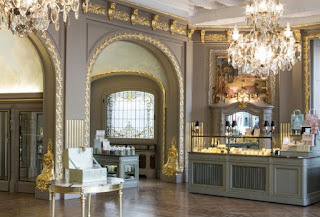 Branding is based on the notion of classic French art de vie; the stores all feature generic late eighteenth-century or Second Empire decor - antique sculptures, pastel walls, frescoed ceilings and, of course, beautifully fashioned fancy pastries piled high in glass cases. There are now five different Ladurie "brands" encompassing toiletries and make-up as well as cakes and chocs, with products launched in seasonal "collections". 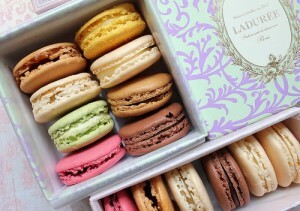 Ladurée's original trade-mark confection is the "macaron" (not to be confused with the Anglo-Saxon coconut "macaroon"). This was originally just a boring hard biscuit - according to tradition the first macarons were baked by former nuns in Nancy in 1792. In 1930, however, the grandson of the Ladurée founder "came up with the idea of sandwiching a creaming ganache filling between two macaron shells and the "French macaron" was born". There are loads of different flavours and colours to choose from. 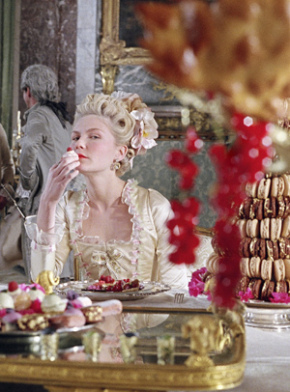 In Spring 2013 Ladurée fought back by launching a "Marie-Antoinette" macaron. 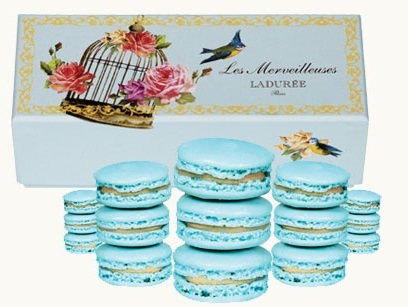 Surprisingly, given the pinkness of the Coppola movie, the new macaron is blue - the shell is flavoured with rose and anise and the cream is based on Ladurée's existing Marie Antoinette tea: aficionados gave the thumbs-up: "It tasted of Chinese black tea, rose petals, citrus fruits and honey, and it was delicious".